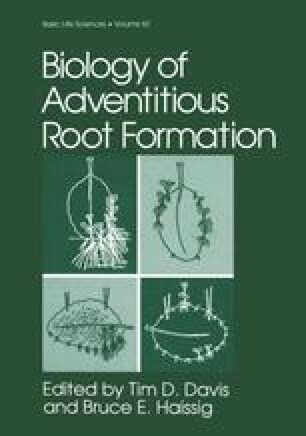 Following reports in the early 1980s that adventitious roots that were transformed with Agrobacterium rhizogenes often grow rapidly in hormone-free medium in vitro, there has been an upsurge in the use of transformed root cultures as a system to study root metabolism and associated root biology. As DNA transfer is involved in the interaction between A. rhizogenes and higher plants, there has also been a great deal of interest in using this bacterium as a vector to genetically manipulate plants. More than 460 plant species from over 100 families have been transformed by A. rhizogenes (Porter, 1991) and in many cases axenic transformed roots have been reported to grow rapidly in vitro (Hamill and Rhodes, 1992). In general, such transformed root cultures are quite stable at the gross chromosomal level, so long as the integrity of the meristem is not disturbed, e.g., by the addition of phytohormones to the medium (Aird et al., 1988a, b). Transformed root cultures have been used for secondary metabolite studies and also, to a lesser extent, to examine the interactions between soil organisms and roots of higher plants (Hamill and Rhodes, 1992). The recovery and growth of plants in soil demonstrates that roots containing Ri T-DNA can provide nutrient and water uptake requirements, though few studies have critically evaluated the differences between normal and transformed roots with respect to these functions.